We are currently working to add more cabins, but our current cabins are sold out. Thank you very much to all those that have registered! 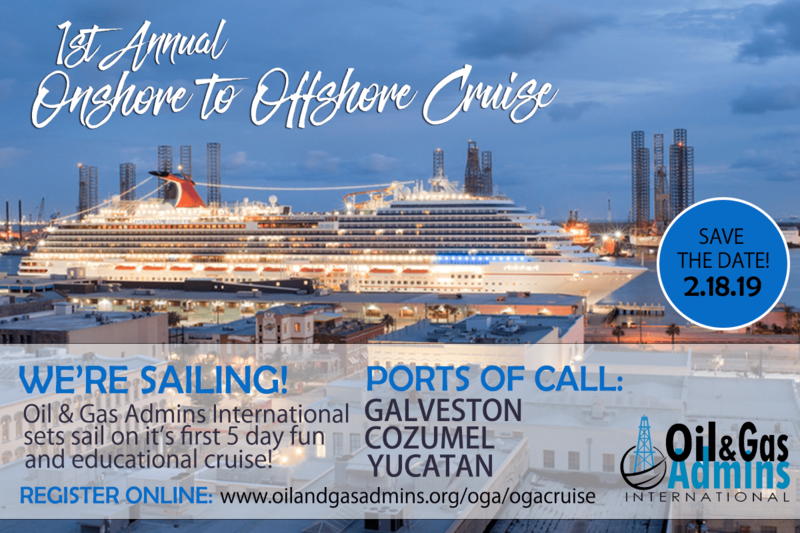 Oil & Gas Admins International is excited to offer our members and supporters what we hope will become an annual Onshore to Offshore cruise! This five day cruise will leave out of the port of Galveston and will dock at the ports of Cozumel and the Yucatan. At each port, O&GA cruisers will have an opportunity for a fun and educational oil and gas experience before going on to enjoy the islands. Oil & Gas Admins International members will receive first priority to register for the cruise. If you are not an O&GA member and would like to join the organization, please click the button below. Prices are based on double occupancy for 20 rooms (40 people total – 2 people per room). What if I am traveling without a companion? Single occupants may be paired with other approved single occupants to meet rate requirements. No. Passports are not required to take the cruise, but are recommended. For passport information, please click here >>. No. Travel insurance is not included. To purchase travel insurance, please contact Catherine Beyt of NHS Voyages at clbeyt@nhsvoyages.com. What are some other charges to expect? Onboard drinks and drink packages, shore excursions, food. Please contact Catherine Beyt of NHS Voyages at clbeyt@nhsvoyages.com for more information. Parking is located in the parking lot across from the ship’s deck. What time should I arrive at the cruise ship to board? Travelers should arrive by 11:30 AM. Are there images of the cruise ship? Click the button below to see Carnival Valor images. All cabin selections are first come first served. You will be notified if your cabin selection is sold out. IF YOU ARE A CARNIVAL CRUISE MEMBER, ENTER YOUR NUMBER BELOW. Please disregard if this is inapplicable. LEAVE THIS FIELD BLANK IF INAPPLICABLE. SPECIAL THANK YOU TO CATHERINE BEYT OF NHS VOYAGES FOR HELPING O&GA ORGANIZE ITS FIRST ONSHORE TO OFFSHORE CRUISE. CONTACT CATHERINE FOR ALL YOUR TRAVEL NEEDS – clbeyt@nhsvoyages.com.